Sweet Rolls is what I have in my mind today. 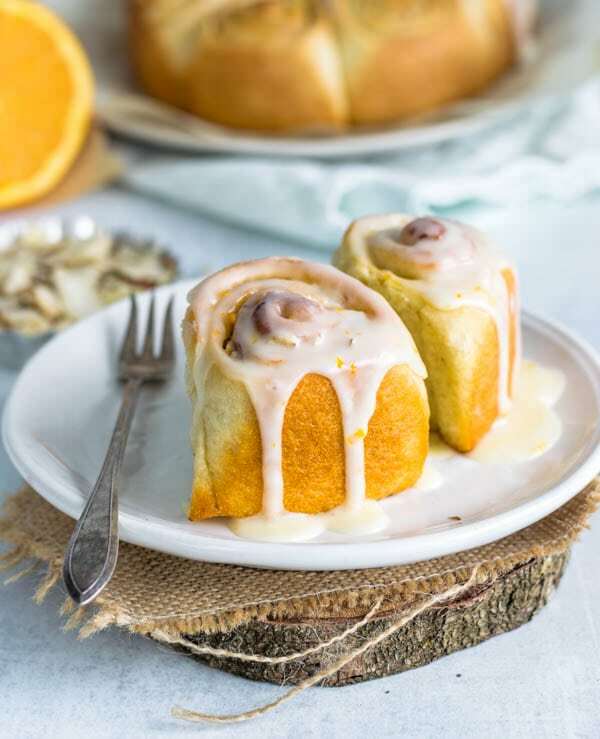 As a matter of fact, Almond Orange Sweet Rolls. When I made this, I used whatever I had home, at hand. So, I had almonds. And I had oranges. Whenever I want to bake something and have no idea of exactly what I want to bake, I open my cupboards and my fridge and analyze what I have available. In essence, it’s like putting the pieces of a puzzle together. Overall, the formula for creating any kind of sweet rolls is pretty simple: dough, filling, glaze. Here is when you can get creative and make whatever kind of glazed buns you wish. For example, if I had lemons and pecans, that could probably be what I’d be posting here today. In case I wanted to go a little more traditional, I’d be making cinnamon rolls. Although, going traditional is never the route I take. Above all, I appreciate originality in a recipe. If you look up cinnamon rolls online, you’ll probably find thousands and thousands of recipes. On the other hand, if you look up orange rolls, or whatever, you will most likely find a handful of those recipes. In order to get creative in the kitchen, you will need to be very bold and a little knowledgeable. Even though I’d like to attribute all of my creativity to my extensive cooking and baking knowledge, that’s not really how it all started. Actually, I was much more of a risk taker than an expert cook when I began experimenting with recipes. As a result, I became experienced in being able to predict what would or wouldn’t work. All things considered, my intuition is my best friend in the kitchen (ok, maybe my patience too). Once you start using your intuition more and more, anything you have in your pantry can become a different and original recipe. And, often times, you will end up wowing your guests and even yourself. Alternatively, you could use Nutella, jams, peanut butter (almond butter, cashew butter), what have you. Also, you could make a cream cheese glaze, a butter glaze, or a simple confectioner’s sugar one. As always, I’ll advise you to use dulce de leche whenever possible. But that’s because I’m a dulce de leche junkie, so I’ll put it on anything. Maybe some dulce de leche and shredded coconut to go inside those rolls. And you might not even need a glaze for this one. Honestly, I could probably sit here and name stuff for you to fill your rolls with until tomorrow. Yet, I’d rather not bore you and just let you go raid your pantry for some bits and pieces of ingredients that need some using up. What I’m trying to convey is that recipes are just nothing more than something someone wrote down that worked for them, in their own kitchen. Generally speaking, you can make whatever works for you if you are bold and resourceful enough in your kitchen. And I do urge you to try and develop this skill. By all means, be a risk taker. Above all, go with your gut. If you read any of my posts, you know this is something I say over and over. Intuitive cooking is where it’s at. When you start listening to your intuition, you will become a good cook. So, this is what I propose to you: experiment! And don’t be afraid to make mistakes. That will only hold you back. For the most part, yes, baking is about precision, accurate measurements, and appropriate method usage (don’t stir too much, don’t stir too little, don’t let it overproof, don’t let it sit, etc etc). But once you know the basic science behind what you are doing, you can be free to create and be your own recipe master! And if you dare to take a risk, make a mistake, you will learn SO much! For knowledge is power! Get your knowledge, get your practice and be the awesome baker and cook you’ve always wanted to be! 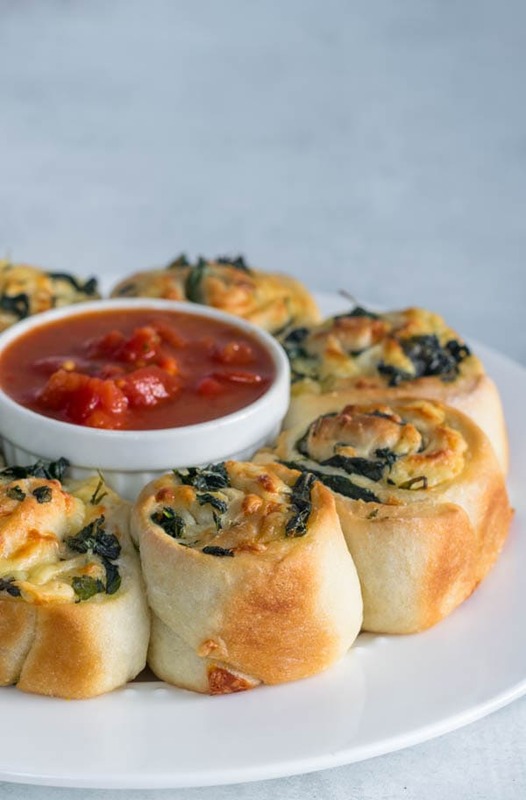 I made these Garlic, Kale and Gouda Cheese Rolls with the same dough I used for the Orange and Almond Buns. I rolled the dough out into a rectangle. Brushed with 2 tablespoons of butter. Spread kale previously sautéed with garlic over dough. Topped with shredded gouda. Rolled it into a log, cut into pieces and baked. Then, I melted butter and mixed with a bit of crushed garlic and brushed on rolls as they came out of the oven. Served with marinara sauce. The gouda and kale were leftovers in my fridge. The chunky marinara sauce was in my freezer. I make big batches of sauce and freeze them in small portions for situations like these. Since we are talking about these amazing rolls, that are perfect for your breakfast table, you might want to check these Espresso Chocolate and Walnut Scones. Just warning you, as a friend. 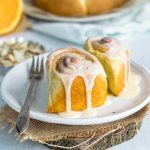 These Almond Orange Sweet Rolls will go perfect for your breakfast table or to go with your afternoon coffee. I use two 6” cake pans to make these rolls. You could use a large 9 or 10” pan if you want to. Mix water, yeast, honey, olive oil in the bowl of an electric mixer. Add flour and salt. Mix with a spoon or with the paddle attachment until dough comes together. Switch to dough hook and knead on medium-low speed for 5 minutes, until dough is soft and smooth. You can also knead by hand against the counter for about 7 minutes. Form dough into a ball and place in a lightly oiled bowl. Cover with a clean towel or plastic wrap and let dough rise for 45 minutes to 1 hour until doubled in size. Transfer dough to a lightly floured surface. Divide in half. Flatten each piece of dough out gently with your fingers into two disks. Try to make it as perfectly shaped as you can. Roll each with a rolling pin into a rectangle about 1/4” thick. Again, try to keep it an even rectangle shape. Spread 3 tablespoons of softened butter on top of each dough piece. In a bowl mix 1/2 cup of sugar, 4 tablespoons of orange zest, 6 tablespoons of sliced almonds and 1/2 teaspoon of freshly ground nutmeg. Sprinkle half of this mixture over each dough rectangle. Proceed to roll each rectangle into a log, try to make it tight and uniform, by slowly rolling from the bottom to the top. Cut each log in half, then cut each half in half and keep doing this until you obtain 8 rolls from each log. Place rolls evenly spaced in pans. Brush rolls with the remaining 1 tablespoon of melted butter. Cover with a clean towel or plastic wrap and let rolls rise for 45 minutes. Bake rolls for 15-30 minutes (check every 5 minutes once you hit the 15 minute mark) in pre-heated oven until golden brown. Mix confectioners sugar with orange juice and zest. You can adjust the consistency by adding more sugar if you want your glaze to be thicker or adding more juice if you want it to be thinner. Pour over cooled rolls. Sprinkle sliced almonds on top. Serve. I love reading your posts Camila!! You always have some interesting tips and knowledge about the recipes! 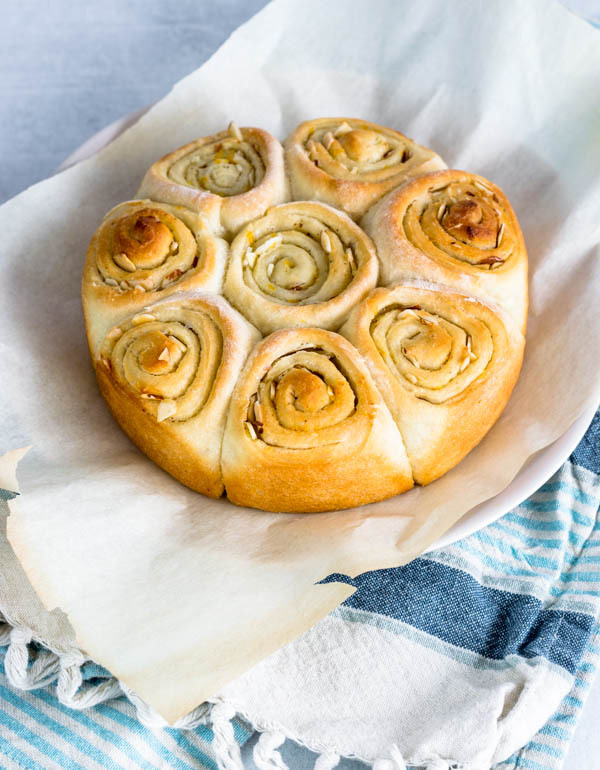 I love trying new recipes for bun doughs, and this one is eggless so I am trying this soon!! Thanks!